Thieves Essential Oil is an excellent blend of essential oils that is specifically designed to support the body's natural defenses*. This proprietary essential oil blend was university tested for its cleansing abilities. It includes Eucalyptus radiata essential oil, which may help maintain a healthy respiratory system*. Thieves essential oil is definitely one of my favorite essential oil blends and I will not leave home without it! A day doesn't go by that I don't use Thieves for something! Did you know diffusing Thieves Essential Oil can Support a Healthy Immune System and Energize Your Body? So diffuse it in the home or office year round to promote wellness*! Make sure you keep it handy when you are going on a plane or train. Or if you are going on a road trip with a pack of kids in the car! Make your own homemade cleaning products or air freshener from Thieves. In a spray, it is fantastic for freshening and elimination odors in rooms, especially the bathroom! I have been known to spray bathrooms at rest stops, airports and horse shows that have Thieves in it. Realtors shouldn’t be without it either! I think you will love the smell, most people do! Its spicy and earthy aroma is refreshing and hot! Or check out Thieves Essential Oil Natural Cough Drops for sore throats and cough! And use them together to promote wellness all year long. This is an easy reference guide for Thieves Oil Blend. It will tell you how to use your oil blend and what to use it for. It will also provide you with some fun tips and testimonials! Want to Purchase Therapeutic Thieves Essential Oil? Go to the Oil Shop! Buy Thieves Oil Here! What is in Thieves Essential Oil? What are the Documented Uses for Thieves Essential Oil? Healthy immune system*; balances solar plexus chakra, purify air and laundry freshener, and household cleaner. What is the Aromatic Affect on the Mind? Uplifting and energizing. What is the Spiritual Influence? Diffusing Thieves essential oil in a room will definitely purify and cleanse negative emotions and vibrations very quickly. Spray some in an emotionally charged room or in your work space. Or use it in a cleansing spiritual ritual as you would with sage, cedarwood or Purification essential oils. This is a fantastic oil for when we feel we need extra protection when there is uncertainty or panic in the air. Use it when global events such as natural catastrophes, war or terrorist threats threaten our existence and we can feel it energetically. My Safe Harbor Blend starts with about 0.5 ounces of Thieves Spray. Then I add a drop or two of Rose Otto Oil to help us release fear and connect with unconditional love and the divine. Two drops of peppermint essential oils to cool friction and calm feelings of terror. And one drop of Juniper for protection. Using Thieves will stimulate the solar plexus chakra. Adding rose will also encourage the opening of the heart chakra. Interested in Dietary Thieves for Your Culinary Adventures? Then check out Thieves Vitality Essential Oil! Good oil for the First Aid Kit? Yes, don't leave home without it! Can this oil be used for Animals? Yes, use extreme dilution if used topically for dogs and cats. Use for supporting wellness and a healthy immune system and promoting overall wellness. What are the Safety Precautions? Children under 18 months of age should not use this oil. Repeated use can result in extreme contact sensitization. Can cause extreme irritation to the skin, therefore dilution is necessary. 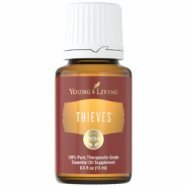 There is a whole line of Thieves Essential Oil products that are awesome! I use them all. Thieves Household Cleaner, Antiseptic Spray, and Laundry Soap are just a few! They are all great! Calling all Realtors! Don't be without Thieves, Purification and Grapefruit Essential Oils to combat all those nasty odors in the short sale or foreclosure home you’re trying to sell. They will cut right through it and your customers will love the aromas! Want to Read More Testimonials or Write Your Own Experience about Thieves? Great! Then just go to the Thieves Essential Oil Experiences Section to begin! Or read other testimonials about the entire Thieves line there! Thank you!